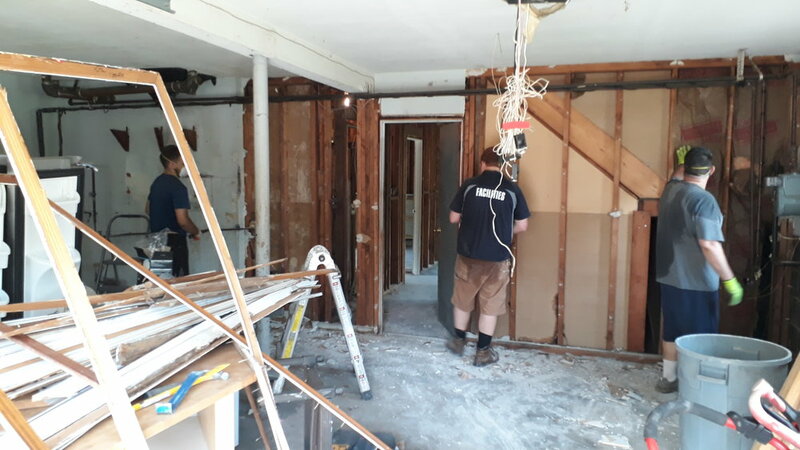 First, we would like to thank everyone who has been helping our facilities team with painting, demolition and other renovation work as we get the parsonage move in ready for Pastor Tim and his family. There has been so much accomplished in the last month. When the inspector was first scheduled to come, a concern arose regarding some structural issues with the home after having ripped up the sub-floor. We are thanking God that the inspector found no issues with the structure of the home and we have been cleared to continue the work. All electrical work has been completed and signed off on by the inspector. We are thankful for a new hardwired smoke detector system that is now in place as well as a new electrical panel and the re-wiring of several outlets that had previously been inoperable. The new tub is in the bathroom and all of the new pipes have been installed and insulated. This is great news as the house had previously had several uninsulated pipes and sections of the house were missing insulation, making it very inefficient to heat and cool, thus driving up the utility bill. A member of a C&MA church in New Jersey also owns a flooring company and has offered to install kitchen flooring and in the downstairs for free! This is obviously a big help. We are thanking God for His provision. The 27 year old furnace is currently not working and is being reviewed as to whether to repair or replace. There is budget available, but it will limit some other work at the parsonage. Pray for a wise decision. The priming is completed and final painting is in progress. If you would like to help with this work please contact the office. The bathrooms are scheduled to have the flooring installed as well as replacing remaining fixtures. The kitchen will soon have new cabinets to replace the moldy ones that were removed. The downstairs rooms will also be carpeted. As always, we are so thankful both for your generous giving to the completion of this project and for your time and efforts on the renovation itself. If anyone has any questions about the project, how money is being used or anything else, please feel free to contact the office and we will gladly assist you. We have obtained all permits from the town of Orangetown in order to finish the renovation work. The house needed an updated electrical panel and outlets repaired. These have been installed to keep from having continued power supply issues to the house. The mold in the kitchen required removal of the subfloor in the kitchen, which has been completed. The bathroom has been gutted and the kitchen cabinets removed. New fixtures are being chosen and the installation work is beginning. Thank you for your continued prayers, generous giving and support for Pastor Tim and his family as they are displaced. We will continue to provide updates as available for the work. If you have any questions please email office@therivercma.org. We have secured all of the necessary funds needed from three sources: The River Building Fund, a Metro District Grant, and an Alliance Development Fund Loan for a total of $60,940.00. Additionally, the Metro District is supporting us by agreeing to pay the first 18 months of loan repayments. Pastor Tim and his family's belongings are in storage at the church facility and have been cleaned to help ensure they do not have a recurring mold issue once moved back in the house. So many of you helped move them out and clean items. Thank you so much for your care of the Binkele family. The downstairs areas of the house with mold issues have been ripped out including the sheet rock on the walls and ceiling, along with the upstairs kitchen tile flooring. Additionally, mold killer has been sprayed throughout the house to prevent further growth. We are very thankful these areas have been addressed as a large amount of black mold was discovered beneath the kitchen floor! A number of areas outside of the house need to be regraded in order to move water away from the house. This process includes ripping out the backyard patio, which is in progress. 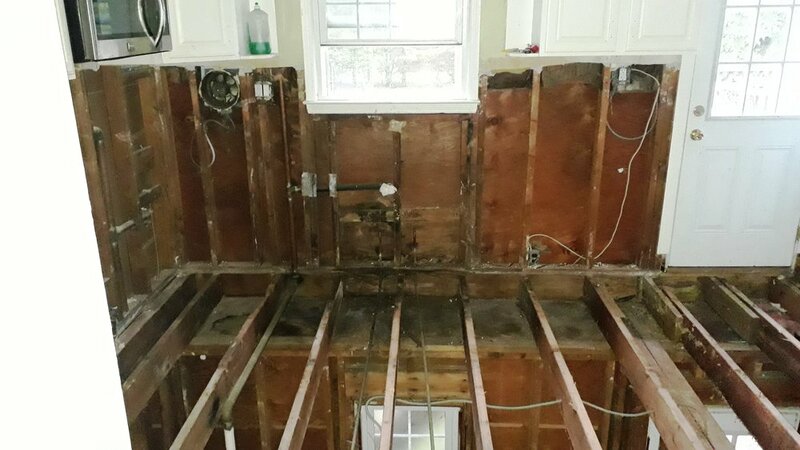 Once permits are cleared with the town, our selected contractor will demo the main bathroom and the kitchen sink cabinets, and then complete all of the work necessary to get the kitchen and bathroom upstairs back in working order. New flooring and sheet rock will go in, as well as a new patio in the back that will be graded away from the house to help keep water away. Fresh paint with a mold killing primer will also be applied in all rooms. You have given so generously of your time and money to move this project forward. We thank God for each one of your gifts and all that you continue to do to serve at The River. If you have any questions or concerns, please email office@therivercma.org.